More than two years ago, the dream started for Assistant Scoutmaster of Troop 84 Chad Bryan. 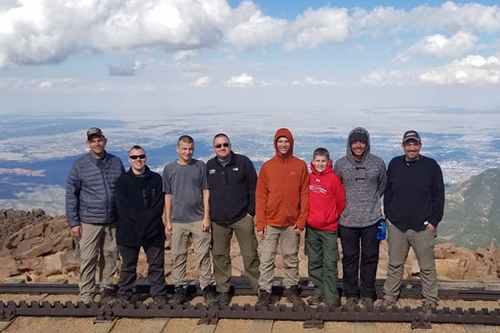 He wanted to lead a group of local Boy Scouts on a hike through Philmont Scout Ranch, considered to be the ‘mecca’ of trips that a Boy Scout can take. Bryan started gauging interest about two years ago and finally received the green light for the trip in late 2016. But four weeks before their departure, Bryan, 5 Scouts and 2 other adults received news that the wildfires in New Mexico would put a halt to their planned hike. All hikes were cancelled through July, 2018 for safety reasons. Instead of dwelling on the cancelled trip, Bryan and the others started to put together alternate plans for the Scouts. So what was the motivation to plan this two-week trip with local Boy Scouts? For one, Bryan will get to spend quality time with his oldest son Dylan who is a Life Scout. This trip will allow for some memorable father-son experiences. But more than that, Bryan wants to experience areas of the country with the scouts that they may have never seen before. He also hopes to push them past their comfort zone and rely on their leadership and survival skills which can benefit them for the rest of their lives.